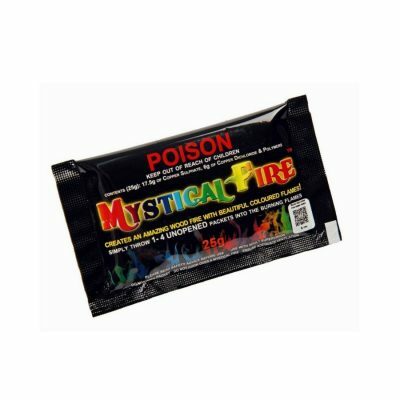 Mystical Fire is a unique product that creates a brilliant display of colourful flames on wood burning fires! Use it to delight the kids, awe your friends, amuse your mates or amaze aspiring magicians. 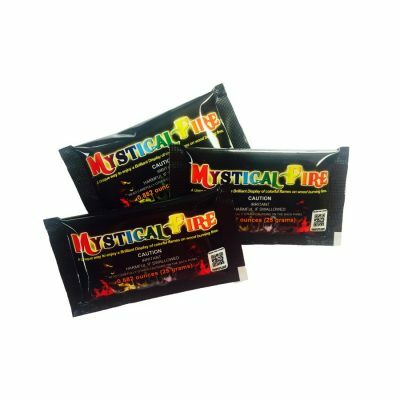 In fact, everyone who enjoys the allure of firelight will love Mystical Fire. With a flick of the wrist as you toss the packet in, you can turn any fire into a mesmerising show of vibrant colours of red, green, blue, pink, orange and violet and more. Lasts up to an hour or longer! It’s safe and easy to use the product. 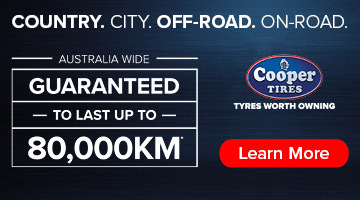 No mess, no fuss, no preparation required. For best results simply toss 1-3 UNOPENED packets into the flames of any wood burning fire. Within seconds it begins producing wonderful coloured flames.